Sports Costs > How Much Do Boxing Lessons Cost? How Much Do Boxing Lessons Cost? 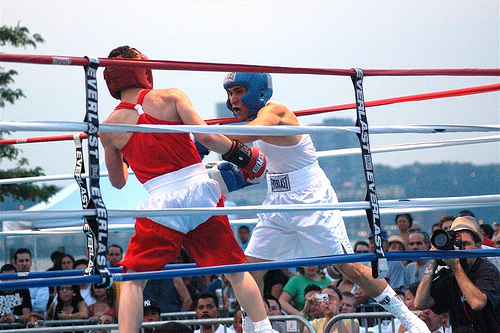 Boxing lessons can teach a person the art, strategy, and technique of boxing, and if you would like to learn the art of boxing, there is a lot more that you need to know besides striking and blocking. While there are only so many tutorials and videos you can watch to try to teach yourself, this will never compare to being taught by an experienced boxer. By learning in person, the instructor can adjust things that apply specifically to you, such as your speed and your technique. The cost of boxing lessons will depend on the trainer, the level, duration of lessons, how many are paid up front and geographical location. For boxing lessons, most professionals, from at least what we had researched, charged anywhere from $35 to as much as $100 per hour. Private lessons, if you wanted to avoid the crowds, could cost $55 to $75+ per hour. Some lessons may be charged by the month, and depending on the policy, this can often include one to three lessons a week, or even unlimited classes, for anywhere from $110 to $300 per month. Again, this will depend on the gym, the credentials of the trainer, and the age of the person being trained. BoxingGyms.com states the cost of boxing lessons can vary anywhere from $15 to as much as $100 per hour. Do not forget to factor in your geographical location; New York will obviously cost more than a city in the middle of Idaho. On a forum thread on BoxingForum.com, forum members claimed that they paid around $150 a month for lessons three times a week. At BodyBuilding.com, a few members talked about what they were paying for boxing lessons. According to the thread, members had paid anywhere from $80 to $170 per month. Brazen Boxing, a gym we had found online offered boxing classes for $75 or $90 per month, depending on the length. Perks included free co-ed classes, access to strength and conditioning classes, and access to the gym 24/7. Depending on your skill level, the lessons will vary. Each trainer will know exactly where you stand and will teach you the ropes of boxing and work your way up the boxing ladder. When the trainer feels that you are ready, they may send you into the boxing ring to fight other students in the class. A boxing gym will have a ring, speed bags, double-end bags, heavy bags and other materials necessary to provide for your training. If it is a health center, it can include additional classes, weight equipment, spas, pools and more. All gyms vary in their facilities. A boxing lesson can help you improve your core strength, help lose weight, develop rhythms, improve hand-eye coordination, reduce stress, and so much more. A typical lesson may include jump roping, shadowboxing, heavy bag work and various bodyweight exercises. If the boxing club requires a membership, it is probably best to factor in $40 to $100 per month. Depending on the policy, it is probably wise to wear loose-fitting shorts, boxing gloves, and protective headgear. Some gyms may provide this; if not, the price for startup gear will depend on what you want to get. Simple gloves, for example, can cost $15 to $45. For younger children, be sure to check out local Boys and Girls Clubs of America. These clubs have fantastic boxing clubs for the youth. Ask about the schedule before you commit. Some gyms can only cater to you during special times. Just make sure that these times do not interfere with school or work. All boxing gyms are not created equally. ExpertBoxing.com shows you how to find a great gym in your area. Taking boxing lessons will be a waste of time if you are not willing to put extra work into it. If all you do is go to a lesson once a week, you will not see much improvement. You will need to practice and work out between lessons if you want maximum results. This is the reason a gym membership is a great idea; you can work out and practice at their facilities a few times a week. Do not choose the gym solely for the price. Instead, you are going to want to focus more on the gym atmosphere and the trainer. Be sure to interview your trainer and see what he can do for you. It may be best to get a gym membership. Those who have a gym membership can often get discounted boxing lesson rates. The longer you subscribe to the lessons and/or gym, the more money you can save. For instance, using the Brazen Boxing example mentioned above, people that reserve a year ahead will save more than those that just do six months. If you or your child is just starting out, do not invest too much money up front. If you pay for a bunch of gear, a gym membership, and a few months of lessons, it may be wasted if the trainee does not like it. Look for specials online. For example, Groupon, from time to time, offers discounts from local boxing gyms. In some cases, the first class will be free to offer you a “sneak peek.” If you feel you don’t know if you will like it or not, then it may be wise to take advantage of such an offer. I paid $25 per hour at a local boxing class. Look into group classes to save money.